Young or old, London is always an exciting destination to visit. There, you can do anything and everything, from seeing world classic theater shows to exploring the sights that have helped shape the modern world. As probably the greatest city in Europe, London delivers again and again. The size and chaos of the place, however, does mean that you’ll have to put some thought into your trip – especially if you’re travelling with the family. Below, we offer five tips for getting the most out of your trip. People who aren’t from the UK have an idea that it’s small – and it is, relatively, but London most definitely not. It’s huge, and if you want to see a lot, then you’ll have to give yourself plenty of time to do so – especially as you’ll have to factor in what each person in your family wants to do too. If you very rarely get a chance to visit the capital city, then go big: it’s better to stay a week or more and do everything you want to do rather than visit just for a weekend and go home thinking you could have done more. London has many different neighborhoods, each with their own characteristics, and you’ll want to find one that fits in with what you want to do during your time there. Transports links are exceptional in London, so don’t think too much about how you’ll get from your accommodation to the sights – think more about what you want from your accommodation, and where you want to stay. As you’re travelling with family on tow, it’s best to look at short term lets by londonservicedapartments.co.uk, as this will give you a space that’s both ‘homey’ and well located. You’ll also be able to prepare meals yourself, which can free up some cash to do other fun things in London! You could stay in London for a month and still not see everything you wanted to see. There’s just that much to do. There are a few essential places to visit – like Big Ben, Buckingham Palace, and the like – but beyond that, it’s all about what you want your family to do. Check out some of the best family attractions at www.visitlondon.com/things-to-do/family-activities and see what would suit your family. You don’t want to make everything you do fun for everybody! Everyone in your family will have things only they want to do, and they shouldn’t miss out. Make sure people have opportunities to visit some of the sights that interest them; Sherlock fans, for instance, will get a thrill from Baker Street; non-fans might not. There’s much to do, but you don’t always have to be doing them! One of the best things about London is doing…nothing at all. Go for a stroll, with no destination in sight, and enjoy all the nooks, crannies, and oddities of this vibrant city along the way. One of the best things about a trip in the British Isles is just how much history you can take in. Given the size of the isles, it’s easy to organise a trip spanning all kinds of looks into the past. From looking at Stone Age wonders to places where major historical events took place, it has it all. Here are just a few of our favourite historical holiday sites for when you’re visiting. If you’re talking about man-made history, we have to start off with one of the oldest and most impressive. Stonehenge is the largest structure of its type in the word, containing huge rocks that travelled over a hundred and fifty miles. No-one really even knows how it was built to this day. Since then it’s played a huge role in local legends, not to mention tourism. Skipping forward in time a bit, but with no less history. The Tower of London is one of the must-see places for a city so packed with attractive opportunities. Used as a prison, a zoo and a place to hold the crown jewels, it’s been central to English history for centuries now. Nowadays, it has tours and rather spooky themed walks you can take to get an idea of what it must have once been like to be a prisoner. When you’re talking about feudal era buildings, you just have to talk about some of the fantastic castles in the country. In our opinion, there’s none more fantastic than Stirling Castle in Scotland. Even approaching it, it dominates the landscape from up on Castle Hill. Featured are statues of famous Scottish heroes like Robert the Bruce. There are also attractions around William Wallace, making it a great tribute to these hardy, independent folk. You’ve undoubtedly already heard of the Dam busters, most likely due to a great classic film bearing the same name. It’s the tale of British pilots who used a newly developed bouncing bomb to destroy dams. A major contribution to Britain’s victory in World War II and one you can experience. Almost. There are no bombs involved but you can visit the location where the Dambusters trained, even taking a flight with Pleasureflights Ltd. The only natural entry on the list and one of the most magical. Ireland has a great legacy for keeping its colourful myths and the Giant’s Causeway is no different. Supposedly built by the giant Finn McCool, the visitors centre gives an excellent retelling of the myth. However, as a natural arrangement of basalt columns created by volcanic activity, the best part is going down to see the causeway itself. A gorgeous and religiously important island off the eastern coast of Britain, Lindisfarne is a serene retreat from the world. It’s quite a wonder that its biggest mark on modern history is being the first major target of the legendary Viking invaders. Whether it’s the spiritual value, historic interest of natural beauty you’re after, this island has it in spades. CAMBRIDGE, ENGLAND: I love visiting university towns…big or small, and when it’s a place like Cambridge, you can never say NO to that. 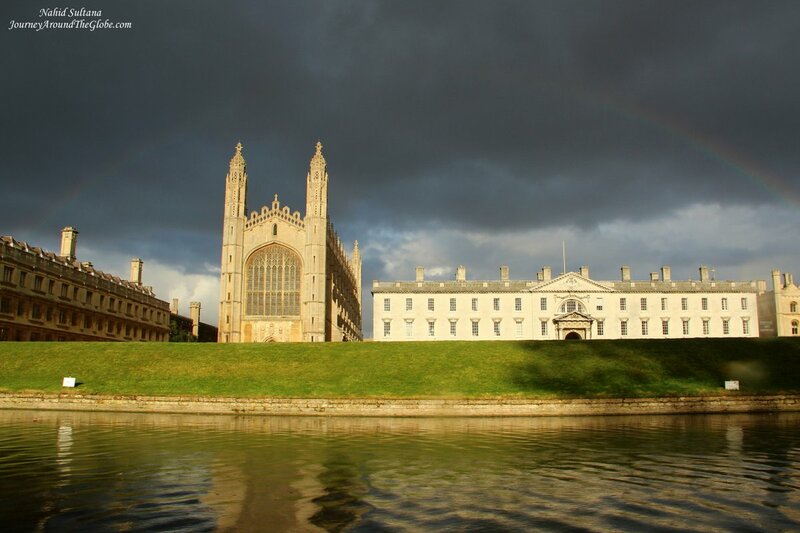 Cambridge is mainly known for world’s one of the most-renowned universities – University of Cambridge. It was founded in the 13th century and since then it has produced many famous alumni like Sir Isaac Newton, Charles Darwin, Jane Goodall, John Milton, Queen Margaret of Denmark, Lord Byron, and hundreds more. The city is about 50 miles north of London. And public transportation being so awesome in England, no one should have any problem getting a train from the capital. Cambridge is a city with green open spaces, fascinating Gothic university buildings, busy students, and peaceful River Cam. This is considered as England’s most unspoiled countryside with many places for leisure walks. TIME of TRAVEL: We were in London in the summer of 2014. That was the first time we took Euro-Star train from Brussels to London that goes underneath the English Channel. It was a one and half hour journey and by the late afternoon, voila…we were in St. Pancreas Train Station in London. First few days we covered London City and all the good stuff there. Then we headed to my aunts/uncles-in-laws’ place in Woolwich. They planned this delighting trip to Cambridge for us per our request. The town was a bit quiet since most of the students were gone for the summer holidays. EATING and SHOPPING: We didn’t come across too many restaurants in Cambridge, I’m sure they were there…we weren’t just looking properly. Because, my aunts-in-law brought lunch from home and we had a little picnic in the Cambridge University Botanic Garden. There was a restaurant/café where we sat outside surrounded by lush green trees and small fountains in the distance. There were some cool shops near King’s College. But we reached there at the end of our trip and everything was already closed by then. 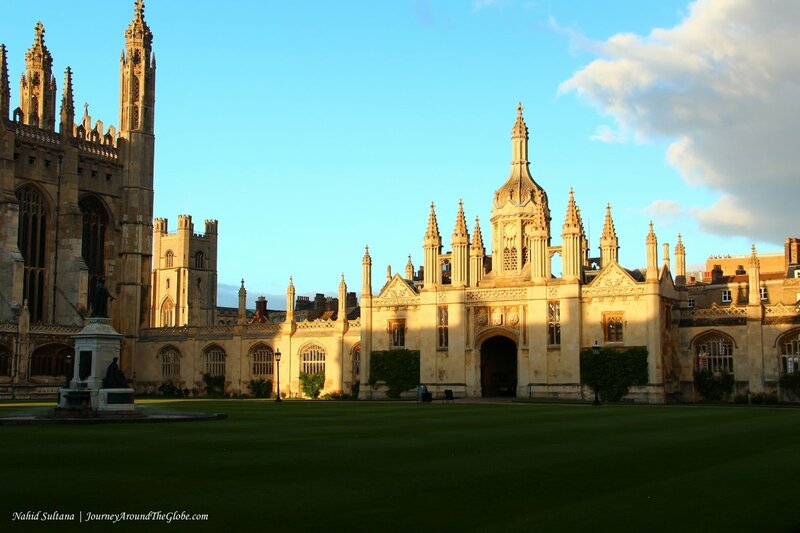 PLACES WE’VE VISITED: We spent a whole day in Cambridge. Of course you need more time to explore this historic yet trendy university town. There are plenty of historic churches, interesting museums, and relaxing gardens for all ages. 1) CAMBRIDGE UNIVERSITY BOTANIC GARDEN: This was a one great day out for our family and an essential for any garden lover. This heritage-listed Botanic Garden was originally conceived by Professor John Henslow, the mentor and teacher of Charles Darwin. It has been open to the public since 1846. The garden’s plant collections today number over 8000 species from all over the world, all neatly displayed amongst the finest arboretum in the region. The 40 acres of beautifully-landscaped gardens and glasshouses offer year-round interest and seasonal inspiration. In the glasshouse, you can discover the plants of mountains, from cactus to tropical rainforests, and arid lands. The Winter Garden is the original master class in gardening for winter interest. The best part is that the garden is designed for both year-round interest and seasonal inspiration. The garden is a natural classroom if you have kids. My girls got backpacks from the ticket office that contained everything a budding naturalist might need, like notepad, pencil, magnifying glass, jar, tweezers, and etc…kept them quite busy for the whole trip. Admission is £4.50 per adult and children under 16 years of age are free. The garden is less than a mile from the city center and a short walk from the train station. Although cycle parking is available, car parking was a bit hard for us. 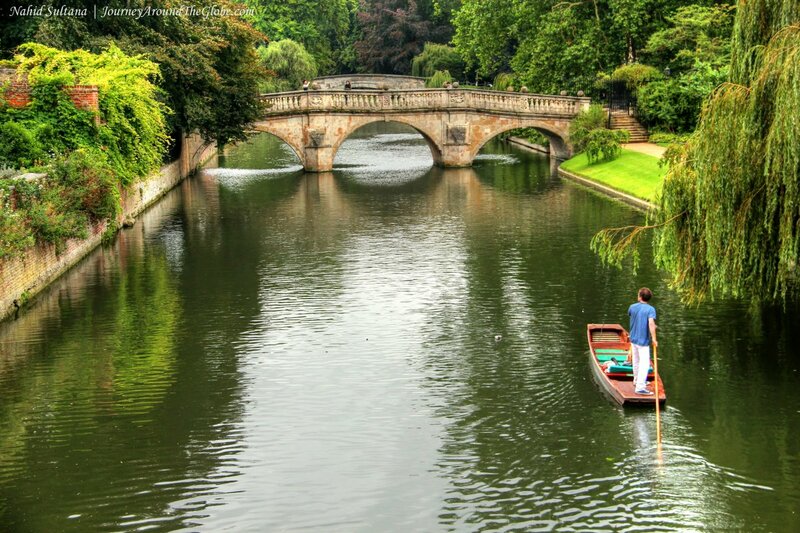 2) PUNTING on CAM RIVER: Punting on River Cam is a must when you are in Cambridge. It’s a traditional way to relax and get around few campuses of University of Cambridge. The water is very shallow here and our guide/punter pushed a long wooden pole against the bottom of the river and took us around on a long boat. It was a pleasant ride no doubt. I don’t remember the cost exactly, but I think, it was something like £20 for an hour ride for maximum 4 adults. 3) KING’S COLLEGE and CHAPEL: We saw mixture of styles in architecture here, since colleges of University of Cambridge were built over many centuries. Most of these buildings/colleges are worth a look. We only visited King’s College and Chapel but if you have spare time try visiting Queen’s college, Trinity College, St. John’s College, St. Catherine’s College, and University Library. Since we had very little time, we only roamed around King’s College. This is one of the most visited spots in Cambridge. 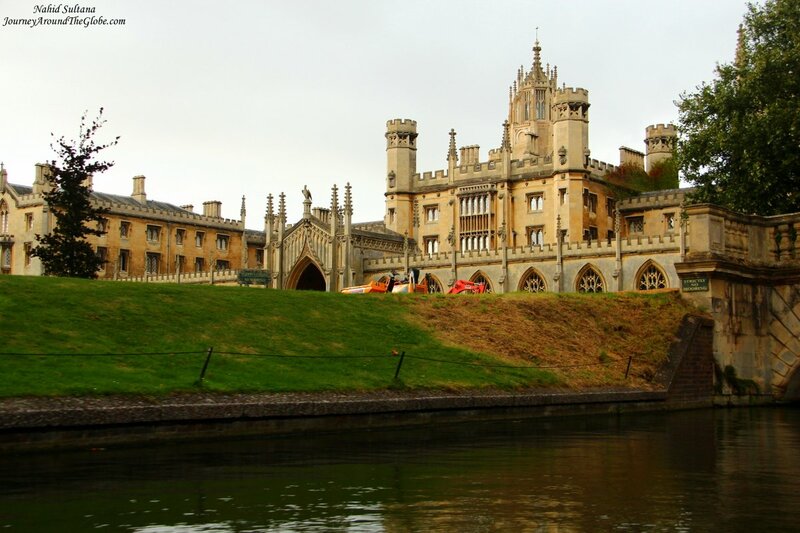 This portion of the university was built by King Henry VI in 1441. Construction of the chapel started in 1446 and took about a century to finish. This chapel is considered as a greatest example of Gothic English architecture and an iconic landmark of Cambridge. The chapel was already closed for the day when we arrived there but at least got to see its grand exterior and famous towers. The choir of King’s College Chapel is supposed to be very well-reputed too, but…next time. We walked around the large ground of King’s College close to the sunset time and enjoyed looking over medieval architecture taking the footsteps of many famous people who once came here as students and contributed so much to the world we live in now. STRATFORD-UPON-AVON and GLOUCESTER CATHEDRAL, ENGLAND: One of the greatest poets and playwrights of all time William Shakespeare’s home, Stratford-Upon-Avon is a historic town on the River Avon. Rich in culture and heritage, history of Shakespeare can be found at every corner in this town. Many old half-timbered houses make this medieval town a cozy tourist destination. Come in summer to see beautiful blooms around here. Center of the town is very attractive and well-preserved. The city is very compact and easy to cover all the major sites on foot. Parking is easy here too. There is a big parking structure only 2-3 minutes of walk from Shakespeare’s Birthplace. TIME of TRAVEL: We took a Baltic Sea cruise from Dover, England in August 2013. This gave us a nice opportunity to visit some of the outstanding places of this country. It was a nice day when we went to Stratford-Upon-Avon to walk around the old town and be charmed by Shakespeare’s legacy. EATING and SHOPPING: Stratford-Upon-Avon has tons of shops in the old town. 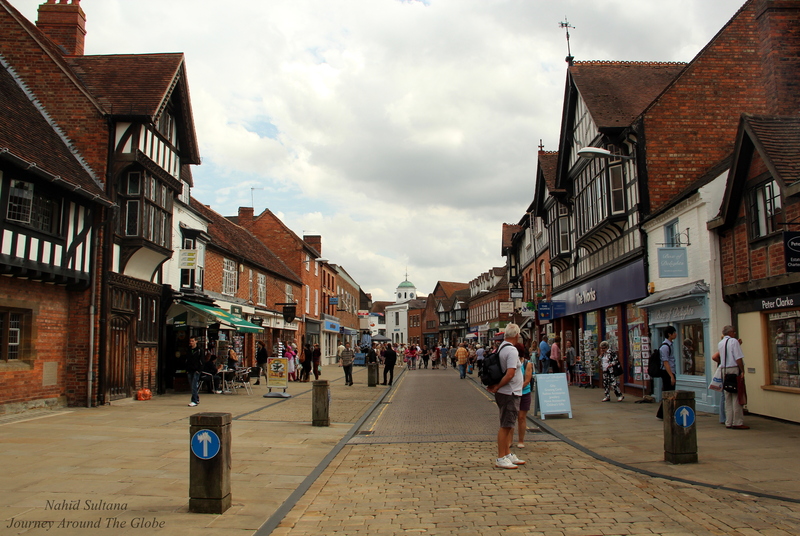 You will find many boutique and souvenir stores all lined up in the pedestrian zone close to Shakespeare’s Birthplace. Many cafes and restaurants are there from quick snacks or meal to some sit down nice places. For our lunch, we picked up some pastries and meat pasties from a local vendor while walking towards Hall’s Croft. I am not so much into fish ‘n chips, I would rather have an English meat pasty anytime of the day. 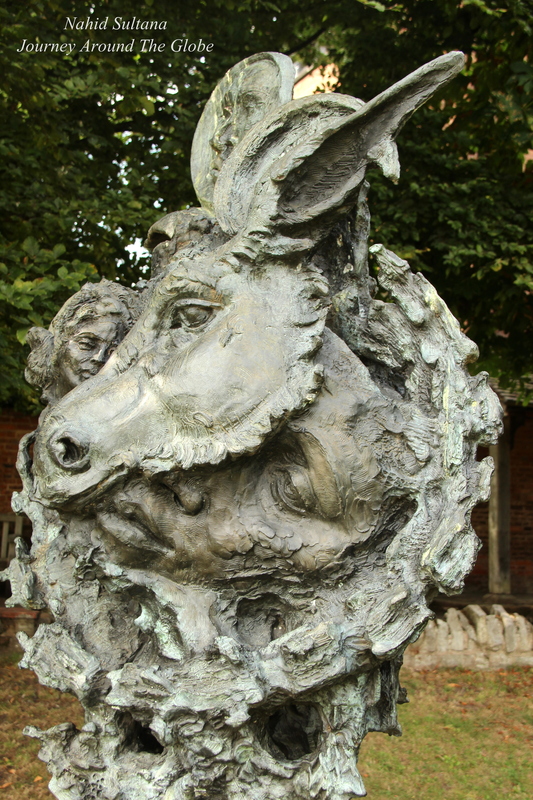 PLACES WE’VE VISITED: It was kind of a weird day for us the day we visited Stratford-Upon-Avon. We stayed at my husband’s old school friend in Cheltenham and both of our girls decided to not come with us and stayed back in their house (even my 3 years old baby). I was a bit worried, since I knew we will be gone for good few hours. But after many years, I finally remembered again how it was to travel without a stroller and little kids…it was nice not to constantly think about if the children are tired from long walk or that we have to sit down for even a small meal. I did miss my girls though, but nice to be just by ourselves and enjoying a worry free day. For this reason, we were actually done visiting the following places within just couple hours, which was fantastic. If you can manage and have time make sure to enjoy a Shakespearean play in prestigious Royal Shakespeare Company or any other theater in the town. But be sure to buy the tickets ahead of time, they are in high demand. 1) STRATFORD-UPON-AVON: Explore the birthplace and family home of the world’s most famous writer William Shakespeare in this little lovely town and wander through beautiful Shakespearean gardens. Then take time out to enjoy a chapter from the remarkable stories of William Shakespeare, the greatest playwright of all time. 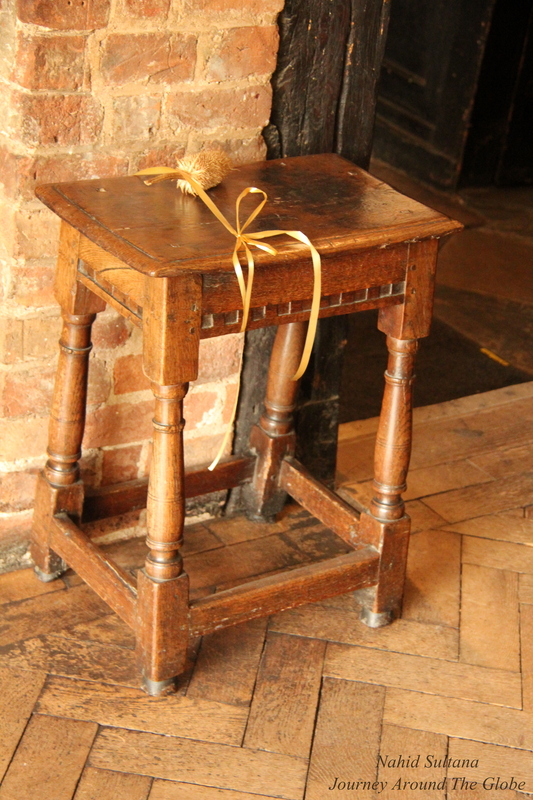 Complete the trip with a visit to the childhood home of William’s mother at Mary Arden’s House and the neighboring Palmer’s Farm, to the first home of Williams’s wife at Anne Hathaway’s Cottage, to his daughter Susanna’s married residence at Hall’s Croft, and to the site of his final home at New Place and Nash’s House next door. 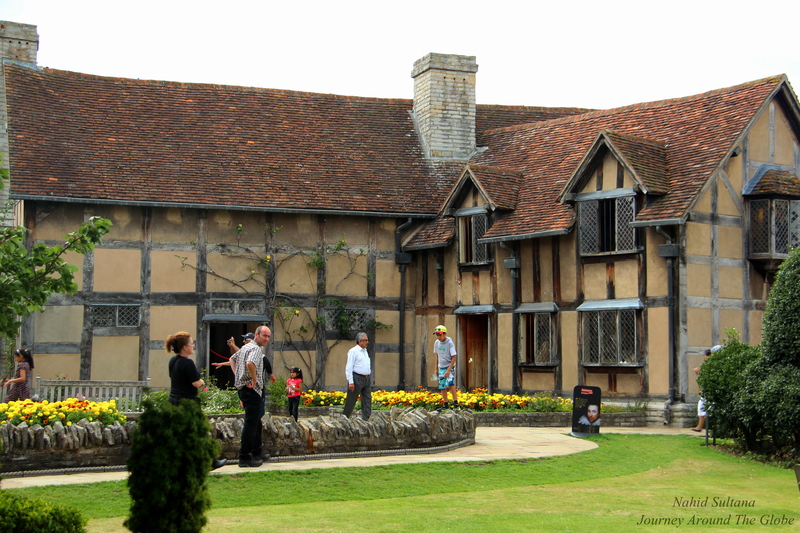 14.95 GBP pass includes Shakespeare’s Birthplace, Nash’s House and New Place, Hall’s Croft, and Shakespeare’s Grave. You can add Mary Arden’s Farm and Anne Hathaway’s Cottage and Garden in this list for 22.50 GBP. We took the first package which took us about few hours to visit everything leisurely. I heard the garden with Anne Hathaway’s Cottage is very romantic and serene. She lived here until she was married to the poet. I would recommend taking the whole package if you have a full day in your hand. 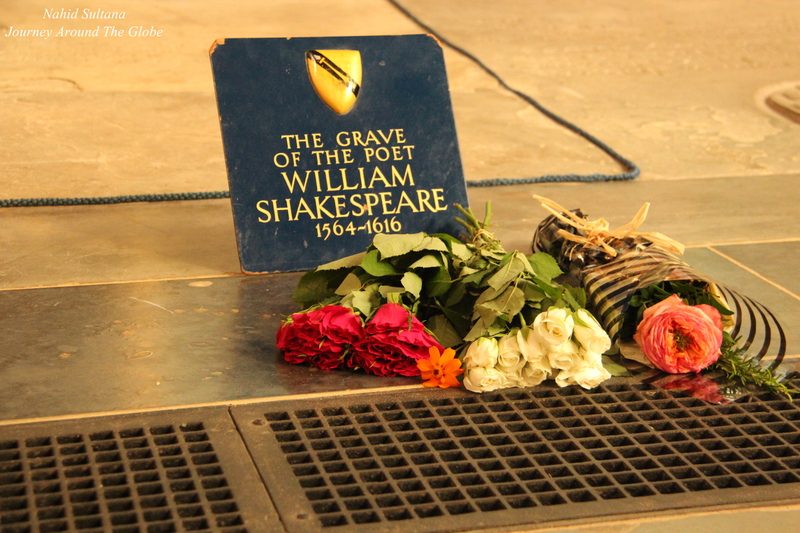 a) BIRTH PLACE of SHAKESPEARE: This is where the journey of Shakespeare – his Life, Love, and Legacy starts. After passing a statue of “Jester” we reached the entrance to his house. We saw 3 videos before entering his house, giving a brief story of him and his family. The design of the house where he grew up followed a traditional plan with ground floor being his father, John Shakespeare’s, service shop area and a central hall. You can see William’s father’s workshop here where he earned a living in making designer leather gloves and purses. Above were bedchambers and attic rooms. Kitchen and brew-house were separate from the house. The birth-room window which was formerly in the birth-room of Shakespeare’s birthplace, became a place for the pilgrims to etch their names into the glass as a symbol of their visit. Princess Diana visited this place in 1992 along with many other royal pilgrims at different times like Queen Elizabeth II, King and Queen of Nepal, Princess from Japan. 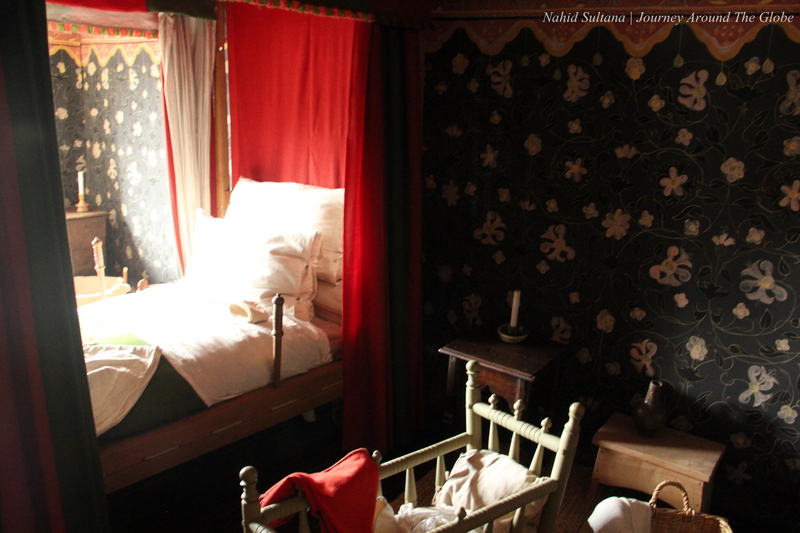 We discovered the bedchamber and birth room of William Shakespeare upstairs of this house. Thick clothe wallpapers cover all the walls of this house giving the whole house a rich look. His birth-room gives a nice view of the garden in front. This house later became a guesthouse. Go down the old stairs and get out to the garden. There was a play of Shakespeare going on with few audiences. If I am not wrong, I think you can request a play to the artists and they will do a specific chapter from Shakespeare’s book and perform it in front of you instantly. 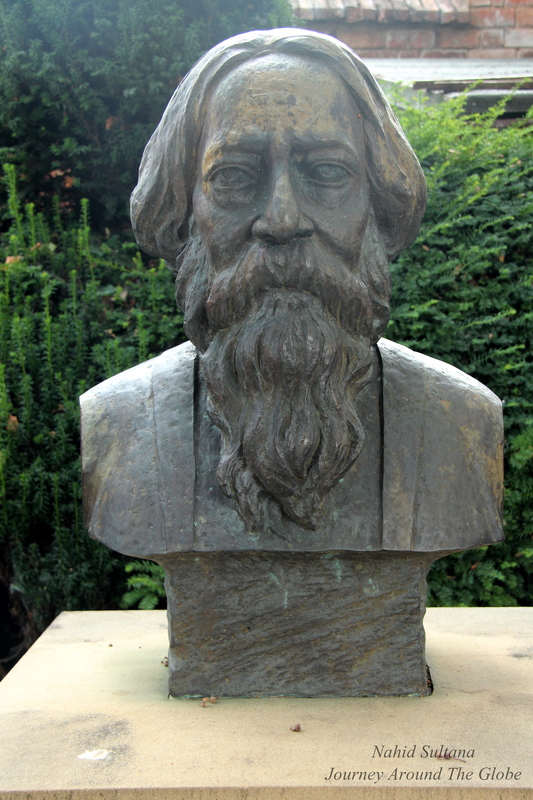 To my surprise, I found a bust of famous writer Rabindranath Tagore in the garden. Tagore was another world-renowned poet/writer and Noble-prize winner from Calcutta, India. He wrote most of his poems, novels, and songs in Bengali which were later translated in many different languages. Bengali being my mother tongue too, it made me feel pretty good seeing this familiar face in the garden where his bronze bust was the only one sitting boldly. The house is open Wednesday to Friday from 10 – 4:30, Saturday from 9 – 12:30 and closed on Sundays and Tuesdays. b) NASH’S HOUSE and NEW PLACE: This half-timbered house was owned by Thomas Nash from the early 17th century, who was married to Shakespeare’s only granddaughter and last direct descendant, Elizabeth. The house later was passed on to her on Thomas’ death. The big room in the lower level contains some fine pieces of furniture of the kind that would have been seen in Williams’ home next door. These include a richly carved dining table and the open shelved court cupboard with floral pattern displaying some early ceramic jars and jugs. This is a nice place to see some outstanding furniture and paintings, a fascinating exhibition of archeological finds from New Place. The house next to Nash’s House was the site of New Place which was bought by Shakespeare in 1597, before he was halfway through his theater career. This was one of the largest houses in town at that time. It was during this time that Shakespeare wrote some of his greatest works. Here he lived with his family and later died under this roof in 1616 in 52 years old. His daughter Susannah inherited this house after William’s death and later Elizabeth. When Elizabeth died in 1670, Shakespeare’s direct family line ended with her, leaving no one to inherit New Place. 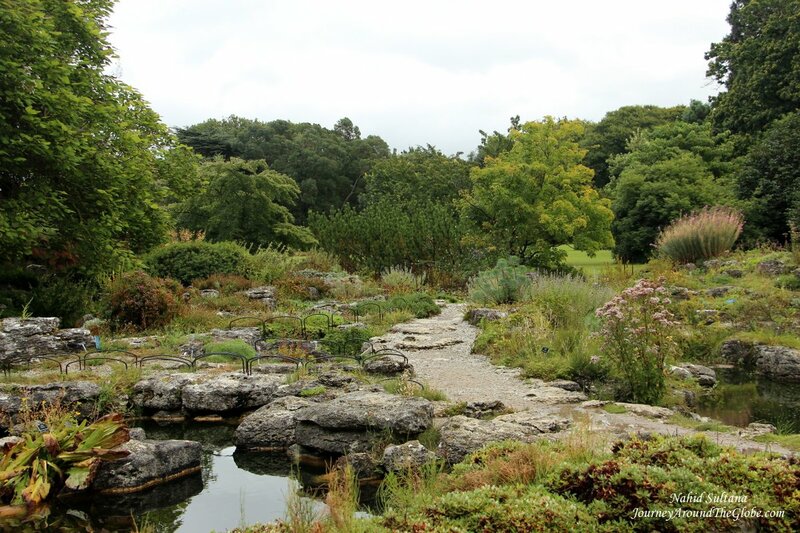 We finished this visit by exploring the beautiful garden outside, called The Knott Garden. It truly is a beautiful place with many flower beds and bronze statues depicting different characters from the writer’s famous plays. Nash’s House is about 5 minutes of walk from his Birthplace. c) HALL’S CROFT: About 10 minutes of walk from Nash’s House and New Place, this is the house where Shakespeare’s daughter Susannah lived with her husband Physician John Hall. The house dates from 1613. It’s furnished to reflect the taste and affluence of someone of John Hall’s status in those days. A finely carved 17th century armchair and draw-leaf dining table, stone fireplace, a group family portrait are some of the outstanding displays of this house. d) GUILD CHAPEL: The Guild Chapel, founded in 1269, is a chapel and school behind Nash’s House and New Place. This chapel has played an important part in the life of Shakespeare and was without doubt one of the buildings particularly familiar to him. It is believed that he studied in the grammar school of this chapel for a while at early childhood ages. 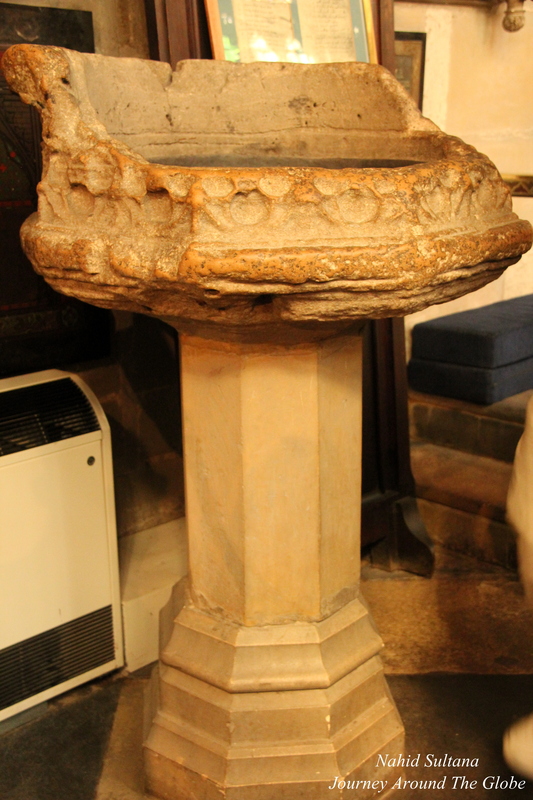 e) HOLY TRINITY: This is William Shakespeare’s burial site and also where he was baptized. It’s an ordinary small church but lots of admirers of the writer come here to see his final resting place. The poet died at 52 years of age in 1616. William and his family’s tombs can be found in front of the high altar of the church and you can see the stone bowl where he was baptized from along with the registration of his birth and death. Historically, there has been a church on this site since the time of Saxon from 713 AD. The present building dates from 1210, with the oldest sections being the tower, transepts, and nave pillars. There is a cemetery surrounding Holy Trinity Church. It’s a quiet place to relax and sit down. Another 10 minutes of walk from Hall’s Croft will take you to the entrance of this church. It is an active church where services still take place, so it is advisable to be respectful when any event is taking place. Entry is free here but donations are accepted. 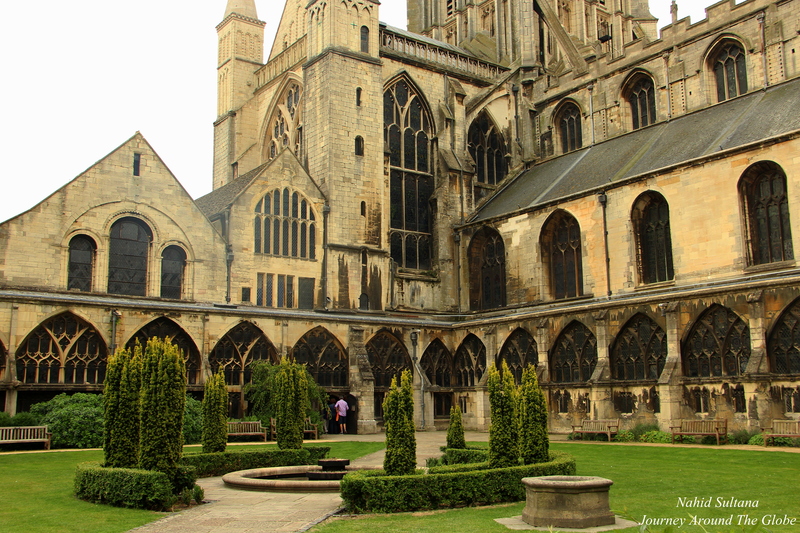 2) GLOUCESTER CATEHDRAL: This cathedral was suggested by my husband’s friend who lives in Cheltenham, U.K. The cathedral is in Gloucester County, mainly known as one of the locations where the movie Harry Potter was shot. Historically, this is a 1300 years old cathedral and an active place of worship. This used to be a monastery once where monks lived and prayed many centuries ago. Beautiful stained glass windows, pretty cloister, typical English style altar, grand organ, pattered ceiling, and floors with biblical pictures are all part it. East Window of it is as big as a tennis court and is about 700 years old. Among many others, King Edward II was buried here inside the cathedral. 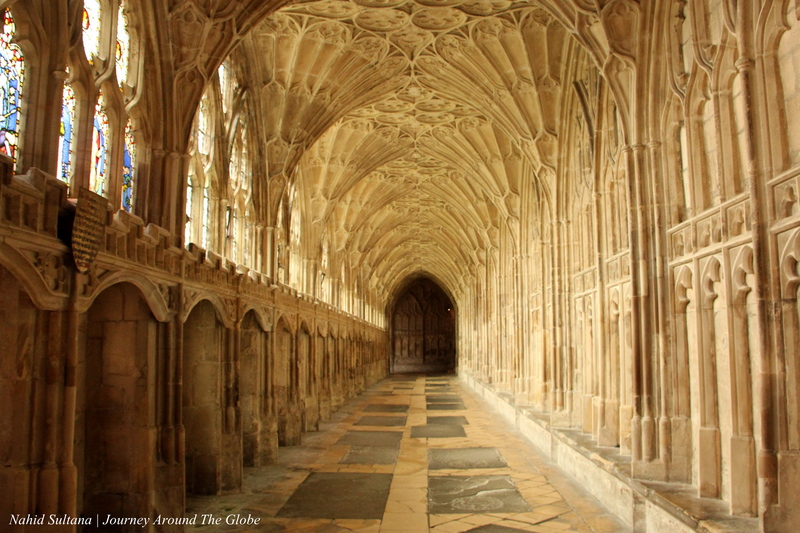 There are no information boards but the hallway/corridor near the cloister was the exact place where small scenes of Harry Potter were shot. We missed the “Harry Potter” tour in the morning that gives all the details on how the movie and this cathedral are related. It’s free to enter the cathedral but have to pay 3 GBP to take pictures inside. Visitors can climb the towers with a guide few times a week.